Rajeev Kamath, Pratibha’s wonderfully active and dedicated parent has written a blog http://itsmesrajeev.blogspot.in/ on his experiences through music in keeping, as Temple Grandin says, our individuals engaged with the world. “I have chosen music as a platform to make life of few individuals with autism and other developmental disabilities more meaningful, in whatever small way I can. In September 2015, we formed a band “Arpan” with four “special individuals” and started using music as a platform to help them engage with the world. I took the responsibility of driving the music band for Arpan, along with my good friend Prashant Apte. Currently our team has four special individuals – Aarti sings; Pratibha plays Sitar; Anand plays Tabla and Chetan plays Bongos / Manjira. We all thoroughly enjoy our weekly music sessions. The team do rhythm exercises together; listen to music together; focus on a song and try to perform it as best as possible. The first song we chose is a bhajan ‘लंबोदर गिरिजा नंदना’ in raag Yaman. First I tried with Aarti to sing the bhajan. I was quite surprised to see the speed at which she grasped the song with ‘perfect’ Sur (Shruti) and Lay (Rhythm). I had to create a short aalap in the beginning, and couple of filler patterns in between the stanzas for Pratibha to play on the Sitar. With just a few practice sessions, she got a hang of it. Anand was already learning Tabla. 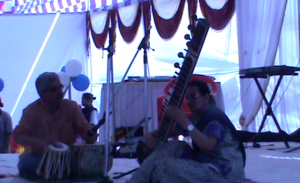 Getting the right rhythm and playing tabla in sync with the singing was a challenging task. My friend Prashant Apte is helping Anand make his playing in sync with the rhythm of Aarti’s singing. Chetan is a highly enthusiastic member of the team, who loves dancing. With a few sessions of rhythm exercises Chetan started getting the hang of playing simple beats on bongos and manjira. A short attention span is an issue with them, but after several sessions, the team is able to perform the bhajan song in a fairly coordinated manner. 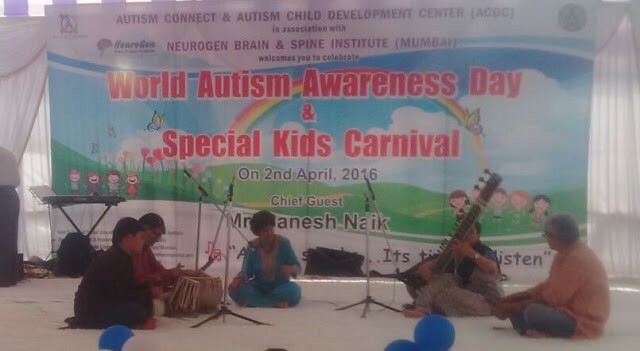 On April 2, 2016, World Autism Awareness day, the team performed the bhajan on a stage in “Special Kids Carnival” organised by Neurogen Hospital in Navi Mumbai. All of them were thrilled to perform on the stage. They thoroughly enjoyed the experience! For me, this was a day of immense satisfaction as my daughter Pratibha also performed a solo on the Sitar. Pratibha presented raag Yaman in Hindustani classical music style that included a short aalap, a medium tempo composition with taans, and jhaala. I accompanied her on the table – a father-daughter jugalbandi was a proud first for me!